Leinster and Munster are in Champions Cup semi-final action this weekend against Scarlets and Racing 92 respectively. Saturday will see Leo Cullen’s men host Scarlets at 3.30 while Johann van Graan’s side will travel to meet previous pool stage opponents Racing 92 at 4.15 on Sunday. Leinster are looking to win the competition for the first time since 2012 while Munster will be hoping they can reach the final and be in with a chance of breaking their decade-long European duck. Leinster will have to make do without scrum-half Luke McGrath but will be boosted by Robbie Henshaw's return from injury. James Lowe will miss out as a result of competition rules on non-European players as Cullen and Stuart Lancaster have plumped for Scott Fardy and Jamison Gibson-Park to start. Speaking at a press conference on Thursday, Fardy said that home advantage will be a major factor. Leinster have played Scarlets twice already this season in the PRO14, winning 23-10 at the RDS Arena and drawing 10-10 at Parc y Scarlets, but Fardy is wary of the Welsh side’s threat. 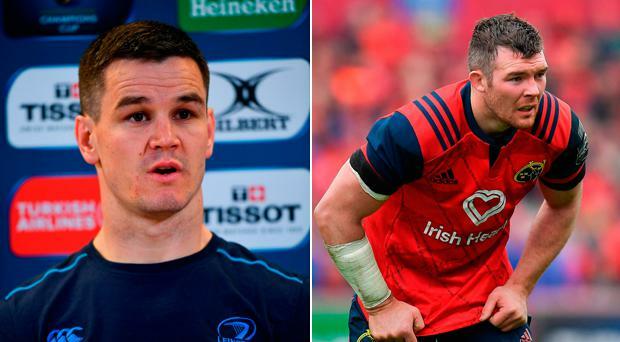 Munster have injury woes of their own and, as reported in today’s Independent, Simon Zebo has been benched with quarter-final hero Andrew Conway set to take his place. Zebo is playing his final season with the province before his summer switch to Sunday’s opponents and has between struggling with an ankle injury of late. Munster won one and lost one against Racing in the pool stage of the competition, edging the Thomond Park fixture 14-7 and narrowly losing a 34-30 thriller in Paris and Second-row Billy Holland believes the game will again be decided by small margins. “In the semi-final last year against Saracens we had opportunities and we didn’t take them,” he said on Thursday. Are Scarlets right to cry foul over Leinster's Aviva advantage?